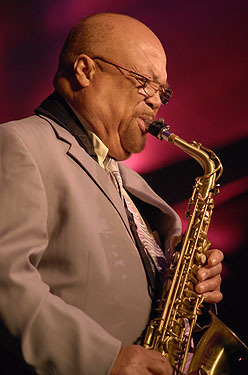 Tenor saxophonist James (Red) Holloway passed away on February 25, 2012. He was 84. Red was a long time collaborator of Etta James as well as an in demand sideman for many others. The list is extensive. Besides Etta James, he played with George Benson, Muddy Waters, Chuck Berry, Sonny Rollins, Aretha Franklin and many, many others He also found the time to record 17 albums as band leader, the last in 2009. An amazing talent who will be missed greatly. Here is a sampling of his talent, now his legacy. This song features Etta James doing the vocals. The saxophone is all Red Holloway. Sublime! Cool song with Red on sax and doing the vocals. This entry was posted in Blues, Music History, Remembering and tagged Blues, Jazz, Music. Bookmark the permalink. the last track reminds me of James Witherspoon. Incredible is a good word. Being hearing this guy all my life and never knew who he was. The last one kind of reminded me of Sharon Jones a bit as well. The brass and the spoken parts anyway. Great song though. I was smiliing all night after I heard it.